Kick off your visit on the 2nd (Mon): take in the architecture and atmosphere at Our Lady Queen of Peace Cathedral, then examine the collection at SSJG Heritage Centre, then explore the different monuments and memorials at Japanese Cemetery, and finally get interesting insight from Tours. On the next day, pause for some serene contemplation at Catholic Diocese of Broome, then identify plant and animal life at Broome Bird Observatory, and then look for all kinds of wild species at Malcolm Douglas Crocodile Park and Animal Refuge. To see photos, other places to visit, where to stay, and more tourist information, use the Broome itinerary website . Toronto, Canada to Broome is an approximately 31-hour flight. You can also do a combination of flight and bus. The time zone difference when traveling from Toronto to Broome is 13 hours. Expect much hotter temperatures when traveling from Toronto in March; daily highs in Broome reach 40°C and lows reach 30°C. Cap off your sightseeing on the 3rd (Tue) early enough to travel to Exmouth. Exmouth is a town on the tip of the North West Cape in Western Australia. Start off your visit on the 4th (Wed): see the vivid underwater world at Ningaloo Reef, then have unforgettable encounters with a shark diving experience, and then steep yourself in history at Potshot Memorial. Get ready for a full day of sightseeing on the 5th (Thu): take in the exciting artwork at The Ningaloo Gallery, then explore the gorgeous colors at Ningaloo Coast World Heritage Area, and then look for all kinds of wild species at Ningaloo Marine Park. To see maps, reviews, ratings, and more tourist information, read Exmouth road trip tool . Traveling by combination of flight and car from Broome to Exmouth takes 12 hours. Alternatively, you can fly; or drive. Traveling from Broome in March, expect slightly colder with lows of 26°C in Exmouth. Wrap up your sightseeing on the 5th (Thu) to allow time to travel to Albany. Step off the beaten path and head to Little Beach and Emu Point. Get in touch with nature at Middleton Beach and Anvil Beach. You'll find plenty of places to visit near Albany: Elephant Rocks (in Denmark) and Waychinicup National Park (in Cheynes). There's more to do: steep yourself in history at Princess Royal Fortress. To find more things to do, reviews, maps, and tourist information, refer to the Albany online journey planner . Traveling by flight from Exmouth to Albany takes 8 hours. Alternatively, you can do a combination of car and flight; or drive. When traveling from Exmouth in March, plan for cooler days and a bit cooler nights in Albany: temperatures range from 27°C by day to 15°C at night. Wrap up your sightseeing on the 8th (Sun) to allow time to drive to Margaret River. You'll explore the less-touristy side of things at Meelup Beach and Sunflowers Animal Farm. Visiting Canal Rocks and Sugarloaf Rock will get you outdoors. You'll find plenty of places to visit near Margaret River: Bunker Bay (in Cape Naturaliste) and Yallingup Beach (in Yallingup). 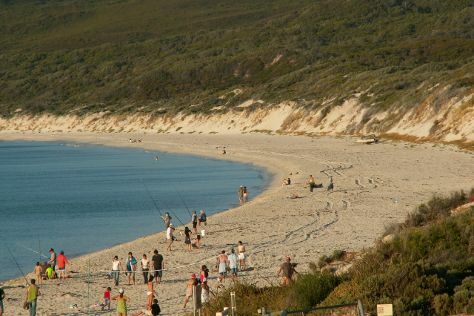 There's much more to do: kick back and relax at Hamelin Bay, identify plant and animal life at Eagles Heritage Wildlife Centre, and take a memorable drive along Caves Road. For ratings, maps, and other tourist information, go to the Margaret River day trip website . Drive from Albany to Margaret River in 4.5 hours. Alternatively, you can take a bus; or do a combination of flight and bus. Cap off your sightseeing on the 11th (Wed) early enough to go by car to Fremantle. Start off your visit on the 12th (Thu): get some thrills out on the water with a waterskiing or jet-skiing adventure, see majestic marine mammals with a dolphin and whale watching tour, and then take in the spiritual surroundings of St. George's Cathedral. 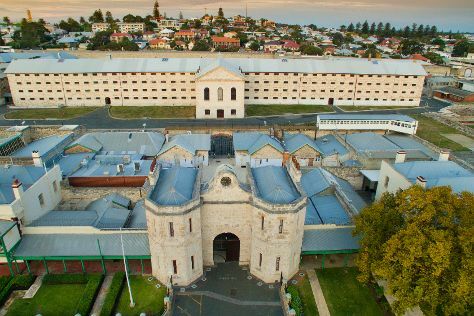 Get ready for a full day of sightseeing on the 13th (Fri): contemplate the long history of The Fremantle Round House and then contemplate the long history of Fremantle Prison. To see other places to visit, maps, where to stay, and more tourist information, read our Fremantle travel itinerary planner . Traveling by car from Margaret River to Fremantle takes 3 hours. Alternatively, you can take a bus; or do a combination of bus and train. In March, plan for daily highs up to 34°C, and evening lows to 19°C. Wrap up your sightseeing by early afternoon on the 13th (Fri) to allow time for travel back home.